FILE - Ice forms as waves crash along the Lake Michigan shore in Chicago, Illinois, Jan. 27, 2014. It might seem counterintuitive, but the dreaded polar vortex is bringing its icy grip to parts of the U.S. thanks to a sudden blast of warm air in the Arctic. Get used to it. The polar vortex has been wandering more often in recent years. It all started with misplaced Moroccan heat. Last month, the normally super chilly air temperatures 20 miles above the North Pole rapidly rose by about 125 degrees (70 degrees Celsius), thanks to air flowing in from the south. It's called "sudden stratospheric warming." That warmth split the polar vortex, leaving the pieces to wander, said Judah Cohen, a winter storm expert for Atmospheric Environmental Research, a commercial firm outside Boston. "Where the polar vortex goes, so goes the cold air," Cohen said. By Wednesday morning, one of those pieces will be over the Lower 48 states for the first time in years. The forecast calls for a low of minus 21 degrees (minus 29 Celsius) in Chicago and wind chills flirting with minus 65 degrees (minus 54 Celsius) in parts of Minnesota, according to the National Weather Service. The unusual cold could stick around another eight weeks, Cohen said. "The impacts from this split, we have a ways to go. It's not the end of the movie yet," Cohen said. "I think at a minimum, we're looking at mid-February, possibly through mid-March." Americans were introduced to the polar vortex five years ago. It was in early January 2014 when temperatures dropped to minus 16 degrees (minus 27 Celsius) in Chicago and meteorologists, who used the term for decades, started talking about it on social media. 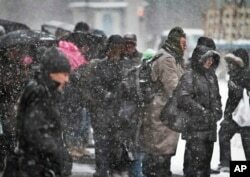 FILE - Pedestrians gather at a bus stop during snowfall along Lexington Avenue, Jan. 21, 2014 in New York. This outbreak may snap some daily records for cold and is likely to be even more brutal than five years ago, especially with added wind chill, said Jeff Masters, meteorology director of the private weather firm Weather Underground. When the forces penning the polar vortex in the Arctic are weak, it wanders, more often to Siberia than Michigan. And it's happening more frequently in the last couple decades, Furtado said. A study a year ago in the Bulletin of the American Meteorological Society looked at decades of the Arctic system and found the polar vortex has shifted "toward more frequent weak states." When the polar vortex pieces wander, warmth invades the Arctic, Alaska, Greenland and Canada, Masters said. While the Midwest chills, Australia has been broiling to record-breaking heat. The world as a whole on Monday was 0.7 degrees (0.4 degrees Celsius) warmer than the 1979-2000 average, according to the University of Maine's Climate Reanalyzer. Some scientists — but by no means most — see a connection between human-caused climate change and difference in atmospheric pressure that causes slower moving waves in the air. "It's a complicated story that involves a hefty dose of chaos and an interplay among multiple influences, so extracting a clear signal of the Arctic's role is challenging," said Jennifer Francis, a climate scientist at the Woods Hole Research Center. Several recent papers have made the case for the connection, she noted. U.S. Postal Service letter carrier Jamie Jasmon struggles through snow and below zero temperatures while delivering the mail, Jan. 6, 2014, Springfield, Illinois. "This symptom of global warming is counterintuitive for those in the cross-hairs of these extreme cold spells," Francis said in an email. "But these events provide an excellent opportunity to help the public understand some of the 'interesting' ways that climate change will unfold." Others, like Furtado, aren't sold yet on the climate change connection. Northern Illinois University meteorology professor Victor Gensini, who has already felt temperatures that seem like 25 degrees below zero, said there's "a growing body of literature" to support the climate connection. But he says more evidence is needed. "Either way," Gensini said, "it's going to be interesting being in the bullseye of the Midwest cold."